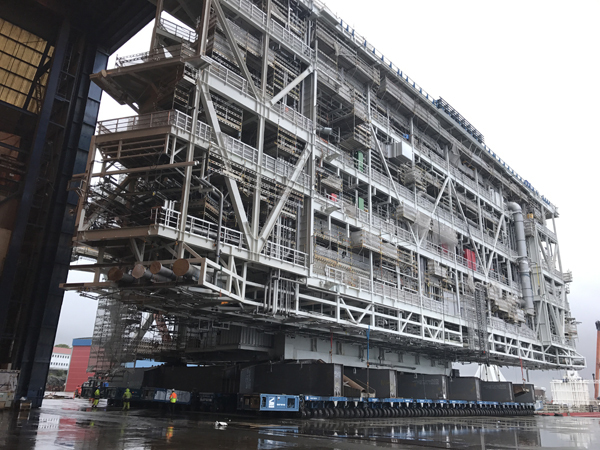 Sarens recently performed the load-out, weighing, and jacking of a 12,200t oil platform module at a quay in Stord, Norway with the help of 432 axle lines of Kamag K24 driven by 22 power pack units. The module is destined for the Johan Sverdrup Oil Field in the North Sea, off the coast of Norway. It will be sailed to the field in early 2019, where it will house more than 200 workers. The platform will include sleeping areas, kitchen, dining room, recreational areas, and utility control systems. Sarens executed the project on behalf of client Kvaerner AS, which is building the housing platform in partnership with KBR. The project scope included engineering, procurement and fabrication, use of Sarens equipment, and execution of the load-out, jacking and weighing operations. For the load-out operation, Sarens transported the 110 x 61 x 26m module from the fabrication hall to the barge, a distance of approximately 200m, on self-propelled modular transporters made by the TII Group. "Despite heavy rain and high winds, the operation was perfectly executed according to the project plan," said project manager Tor Arne Naess. Sarens operators used thirty-two 500t weighing cells to determine the LC-LL module's exact weight, which totaled 12,200t. Next, they jacked the module approximately 13m above the barge deck so the grillage could be installed. For this, they used four towers of CS 5000 jacking systems. Most of the Sarens equipment was mobilised from headquarters by ship, while the rest arrived by truck. It took 20 days to complete the rigging, as the complex surface under the module required a lot of cribbing on the trailers.